You can add Super Glue to your list of inventions that were discovered by accident. Dr. Harry Coover was not trying to invent a super-sticky substance when he came across Super Glue. In 1945, Dr. Coover was actually working on a way to create a clear plastic to use in precision gunsights for Eastman Kodak. Cyanoacrylates were not a suitable material for this application. Dr. Coover discovered that the chemicals were extremely sticky. Moisture caused the chemical to polymerize. Every object has a thin layer of moisture so the chemical bonded almost any objects together. Testing on the cyanoacrylates was abandoned for now. In 1952, Dr. Coover was involved in a very different project. He was working in the Eastman Kodak’s chemical plant overseeing a group of chemist who were looking for heat-resistant polymers for jet airplane cockpits. A rediscovery of the cyanoacrylates showed their full potential. They began testing the monomer and discovered that it did not require heat or pressure to adhere two objects. Again every set of objects that was tested were permanently bonded by the substance. This time Dr. Coover saw an opportunity to create a new adhesive. He applied for a patent on June 2, 1954. 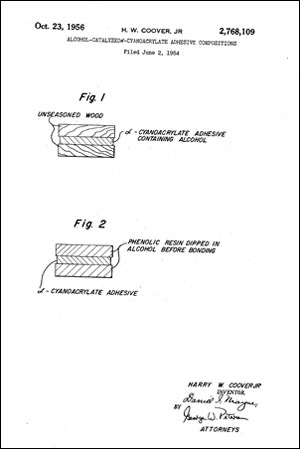 On October 23, 1956, he received United States Patent 2,768,109 for Alcohol-Catalyzed Cyanoacrylate Adhesive Compositions. 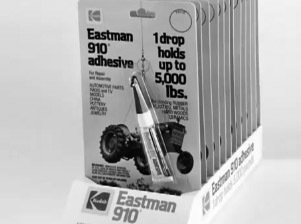 After refining the chemical, a new product originally known as Eastman 910 hit store shelves in 1958. Dr. Coover became known as Mr. Super Glue after he appeared on a national TV show promoting his product. He was on the show “I’ve Got A Secret” to demonstrate the amazing ability of his adhesive. The host of the show, Gary Moore, was seen hanging upside-down stuck to a metal bar. Supposedly, only one drop of Eastman 910 was used to stick him in that position. Kodak never capitalized on Dr. Coover’s invention. The product did not become a commercial success until after the patents had expired. Dr. Coover, therefore, did not become rich off his discovery. Despite having more than 460 patents, he was still always most known for his invention of Super Glue. Dr. Coover was inducted in the National Inventors Hall of Fame in 2004. In 2009, he received a National Medal of Science for his invention. Today, Super Glue is used for a wide range of applications including medical. Super Glue is now even used to replace stitches for the treatment of cuts and to close incisions.